Dinosaur/dinosaur genera: Dimetrodon attacking an Eryops, both living during the Permian period 245-280 million years ago, long before the dinosaurs evolved. 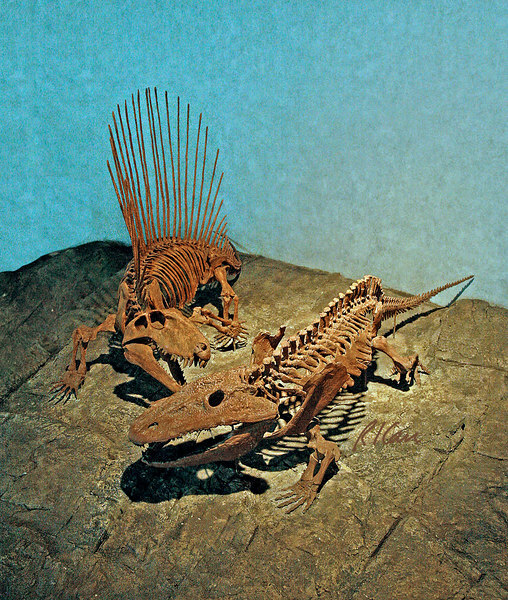 Dimetrodon was a mammal-like reptile, an ancestor of mammals, about 11 feet long weighing 500+ pounds, with a large sale-like flap of skin along its back supported by long, bony spines. It had sharp teeth and clawed feet. The Eryops was a common, primitive amphibian living in swamps, a meat eater with stout body and very wide ribs. It was 5 feet long, a large land animal for its time. Museum of Nature and Science, Denver, Colorado 2005.